Isibindi Africa Lodges is delighted to announce the launch of The Isibindi Foundation in March 2019. This is an exciting day for the founders of Isibindi Africa Lodges, who come from conservation backgrounds and have partnered for 24 years with our neighbouring communities on many pioneering community and conservation projects. The launch of the foundation cements these various initiatives under one umbrella and improves our reach and resources as our guests’ philanthropy continues to grow. Nunu Jobe (a.k.a The Rhino Whisperer) and Shaun Maitre formed Isibindi Africa Trails in 2016, with Nunu Jobe being the single biggest shareholder in the company. Formerly he was a head guide for the KZN Wildlife uMfolozi Wilderness Trails. The company currently operates from Rhino Ridge Safari Lodge and offers guided walks in the park, offering employment to 3 guides. Guests frequently rate this walking experience as one of the highlights of their trip to South Africa. 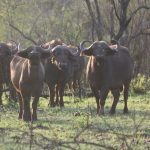 Located alongside the Hluhluwe iMfolozi Park, in the Hlabisa district of KwaZulu-Natal, the Nkosi family offers a Zulu home stay within the Mpembeni community environs. The whole family is involved in the venture which offers an authentic experience of Zulu culture and traditions. Accommodation is serviced and meals are provided by the Nkosi family. Guests book privately through Isibindi Africa Trails or from the neighbouring Rhino Ridge Safari Lodge as a popular and authentic alternative to a safari camp. 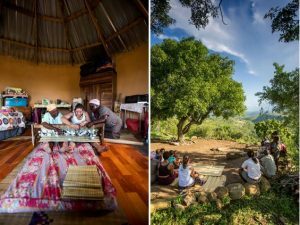 Home Stay guests have the opportunity to wander through the community viewing woman weaving grass mats and baskets, drink homemade beer and ilala palm wine or simply mingle with the community. Try your hand at the traditional art of grass mat-making, or join an indaba (discussion group) under the trees. Images by Teagan Cunniffe, published in Getaway Magazine. clubs, at four of the local schools. When you book a stay at any of our lodges, please do ask about joining a visit to one of our local community projects. Your holiday will be richer for the experience, knowing you are contributing towards a better future for so many people connected to our lodges in rural KwaZulu-Natal.